Caulk is a material that is used on almost every single structural project. Caulk has many uses in the construction industry and almost every construction professional has come in contact with caulk at least once in their lifetime. Follow these recommendations on how to remove caulk from your surface using non-electromechanical tools. 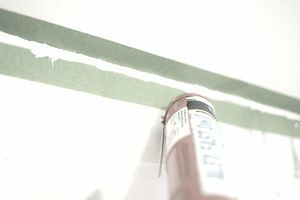 If the caulk is elastic, little or no dust will be developed. Using this tool can require several man-hours to remove, that's why is suitable for small surfaces or used to remove brittle caulk. If you are looking for a high-effective low labor cost, you have come up with the wrong procedure. A ripping chisel is essential when removing hard caulk. It is ideal when the caulk is situated in angled planes and difficult to remove areas. It will generate low dust, and it is not recommended when caulk lengths exceed 100 meters. Using a ripping chisel instead of a utility knife will allow you to exert additional pressure facilitating the caulk removal process. It might be used when the joint gap exceeds 2 inches wide. A ripping chisel must be handled with care to avoid damaging adjoining parts. A putty knife is maybe the most used tool to remove caulk. It is suitable when the surface will be reworked and for removing loose or crumbling caulk. A putty knife is recommended for rough joint surfaces, although it provides a poor cutting action. Removing caulk with a putty knife will produce small debris particles that must be aspired by mechanical equipment and it is not recommended on large joints or where hard caulk is found. Using a bush hammer to remove caulk might be an option for your construction project. Although not commonly used, a bush hammer could be used for knocking away hard or well-glued caulk applied on hard surfaces. Its use is limited to hard surfaces and produces low dust contamination. A hammer and chisel might be used to remove caulk on very hard or extra wide joints, preferably wider than 1 inch. It is recommended for very hard caulk. However, extra cautions should be taken to avoid possible damages to surrounding surfaces or structural parts. Dust aspiration equipment- Can be used to reduce the amount of dust created from tools/methods that can generate higher dust volumes. HVAC systems should be turned off when removing caulk to avoid dust contamination in other areas. Gloves and skin protection - Chemical-resistant gloves and Tyvec coveralls are the standard personal protective equipment. Pay particular attention to the type of gloves and how long gloves can be used when working with solvents. Some type of solvents might affect the glove material and might expose skin parts to chemical components. Eye protection - All workers should wear safety glasses or protective goggles.